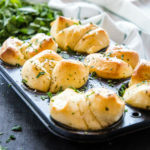 These Easy Homemade Garlic Butter Dinner Rolls are the perfect for your Sunday dinner or holiday table! Made from simple dough, garlic butter and sea salt! In a 2-cup glass measuring cup, add the water, yeast and sugar, and stir together with a fork. Set aside to rise. Add the flour and sea salt to the bowl of your stand mixer fitted with the dough hook attachment (use a large bowl and a wooden spoon if you don't have a stand mixer). When the water, yeast and sugar mixture has risen up slightly and is nice and fluffy, add it to the mixing bowl along with the egg and melted butter. Turn the mixer on low speed and mix until the dough comes together. Turn the speed up just slightly until the dough forms a very soft ball around the dough hook and clears the sides of the bowl. If the dough appears very sticky and too fluid, add the extra 1/4 cup flour. Cover the bowl with plastic wrap and rise in a warm place in the kitchen for 90 minutes or until the dough at least doubles in size. When the dough has finished rising, grease 2 muffin tins (you'll need about 18 cups) with a little bit of melted butter and set aside. Melt the 1/3 cup butter in the microwave and stir in the garlic, parsley and sea salt. Set aside. Punch the dough down after it rises and divide the dough in two equal parts. Roll out one part of the dough on a lightly floured surface using a rolling pin into an 12-inch by 12-inch square. Use a pizza cutter or sharp knife to cut the square into 9 smaller squares (make a tic tac toe shape with the large square). Brush each of the 9 squares with the melted butter mixture. Twist each square one and a half times in the middle and place them twist side down into the muffin cups. Repeat with the second half of the dough. Once all the dough squares have been twisted and placed in the muffin cups, brush the tops with the leftover melted butter mixture. Cover the muffin tins with a clean kitchen towel and let rise a second time for about 20-25 minutes. Bake at 350 degrees Fahrenheit for about 15-18 minutes or until the rolls are a light golden brown colour. While the rolls are hot, sprinkle with some flaked or coarse sea salt and some chopped fresh parsley, if desired. Remove them from the muffin cups and let cool completely on a wire rack before serving.